Delving deeper into the Liechtenstein jewel collection one will inevitably come to this goody, a diamond tiara owned by one of the junior branches of the family. As we have pointed out time and time again, the Princely Family is a pretty large family while our blog's coverage only focuses on one part of the family, the descendants of Prince Franz Josef II, father of the current sovereign prince. One thing all these branches of the family have in common is one ancestor, Prince Johann I. The tiara is made of diamonds set in three large honeysuckle motifs with two seperate diamonds set between the different honeysuckles. Who exactly the owner of this tiara is, I cannot tell you. 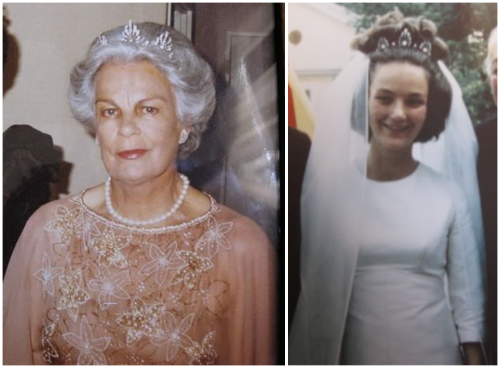 There is visuals evidence of this tiara being worn by the late Princess Karoline (1912-1996), her daughter-in-law Princess Maria-Theresia as well as other ladies of their family branch. Born a Countess of Ledebur-Wicheln, Princess Karoline was the maternal aunt of the Princess Marie as well as - in this connection more importantly - the wife of Prince Johannes Franz of Liechtenstein, who was a first cousin of Prince Franz-Josef II. Both the wife and some of the daughters of Princess Karoline's oldest son, Prince Eugen-Hartmann, have also sported this diamond sparkler at their respective weddings, the last one of them being his youngest daughter, Princess Sophie, at her 2012 wedding to Count Clemens Hoyos.